Dallas-based attorney John Barr keeps a few things on his desk: his mother’s cards, photos of his daughter, a photo of St. Louis Hall and a card from the late Rev. Louis Reile, S.M. (B.A. ’49), a former Associate Professor of English at St. Mary’s University. Reile would become a lifelong colleague and friend — and one of the men who gave him a chance to attend St. Mary’s. Barr (B.B.A. ’77, J.D. ’80) was not the typical college applicant. When he was 12, Barr ran away from home to work for the Dell & Travers Shows — deemed by some to be the carnival equivalent of the Barnum & Bailey Circus. The experience lasted only a summer, but Barr’s time in traveling shows continued. Among other jobs, Barr worked for Terry Bassett, one of the owners of Concerts West, and saw many rock ’n’ roll bands play, including the Eagles. At St. Mary’s, he met Reile and the Rev. Paul Ryan, S.M., who was Registrar at the time and took a chance on Barr despite his low test scores. Barr earned a Bachelor of Business Administration degree in Finance and Risk Management and tried to enter law school at St. Mary’s, but was rejected because his grades weren’t high enough. When he was caught by the police chief, Barr confessed to Castleberry that he was the mystery washer. After Reile argued on his behalf, Castleberry took a chance and admitted Barr to St. Mary’s Law. He not only made it through law school, but also scored high on the bar exam. 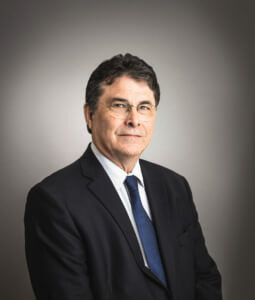 Barr’s career soon rose from humble to high-profile when he headed the investigation of the Aeroperú Flight 603 disaster. That investigation led to the recovery of dozens of bodies when the plane crashed off the coast of Peru in 1996. “The years of working in show business and having to handle outrageous requests made me develop the mindset that you can do anything because you don’t know you can’t,” Barr said. As a result of that investigation, Barr has routinely been called to do pre-litigation investigations for catastrophic losses. Barr has also regularly worked with Mexican entities, including the secretary of energy and the attorney general of Mexico. His business with Mexico began after he assisted with the investigation of Gerardo de Prevoisin, known in Mexico as the “aviation czar,” when de Prevoisin fled the country to evade arrest on fraud charges. With 37 years of trial law experience, Barr credits his success to a few things: St. Mary’s, his Catholic faith and hard work. “St. Mary’s taught me the nuts and bolts of how to be a lawyer,” he said.